We sense something and we understand it very differently. 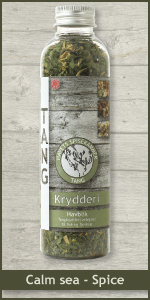 We have focused on the seaweed and composed an exciting spice with lemon peel, marigold, dill, fennel and wild garlic. The calm sea spice is very good for dishes with fish. It does not matter if the fish is steamed, boiled og fried. Seaweed (Kombu), lemon peel, marigold, dill, fennel and wild garlic.